Some two weeks ago I took a part here on my blog in a seven day Black and White photography challenge, I loved these seven days with my camera with only light to work with, very much. However ever since I just wanted to get out and find as much of natures winter colours as I could find. At first this task looked a little harder than I thought it would be, so much of nature has died back as we slip into the early winter weeks, yet the more you look the more you find. 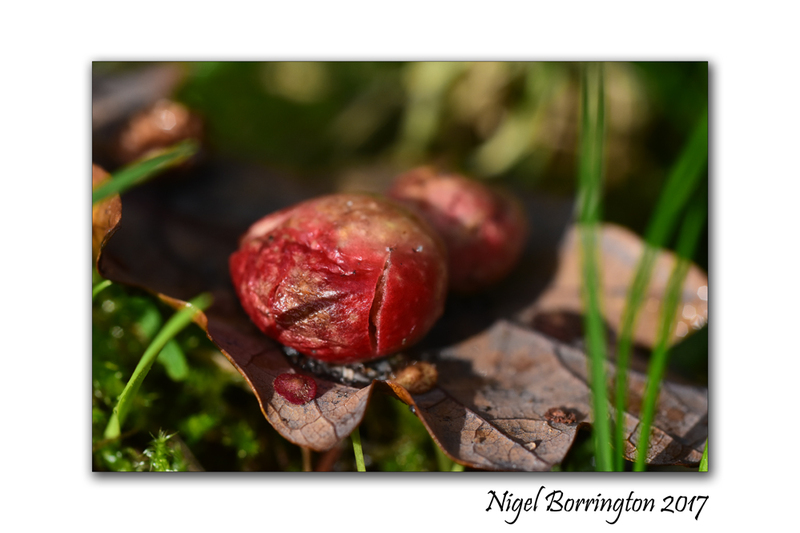 Like these strong reds of slowly rotting berries I found just sitting on a fallen Oak leaf. Red has to be on of the strongest colours of autumn and early winter, it feels like the colour of the last signs of life as much vegetation turn red just days before its finally returns to the ground, the very place it took its first energy of life from. This entry was posted on November 24, 2017 by nigel borrington. It was filed under Comment, Gallery, irish woodlands, Nature, Nature and Wildlife, Solo images, Winter colour and was tagged with irish woodlands, Natural colours, Nature photography, Nigel Borrington, November colours, Red in nature, the colour of nature, winter, Winter colour.